The Internet isn't just showing up as THE medium for transferring information in our century with all the advantages of being fast, accessible to everybody in the whole world etc. (By the way it has to be said that this is a fallacy anyway. Although these are the common characteristics of the Internet truly speaking these are not the facts.) Again, it is not just a medium for communication about theatre, it can also be material for theatre and it can be used as a place to stage plays. Artists in general are always asked to reflect the world in which they live in their very special way. No wonder that artists react to a phenomenon like the Internet, which is getting more and more important in our society - in an economically global context as well as in our private lives. But this technically new phenomenon doesn't just invite criticism it also opens up a new forum for all art forms: for the arts as well for literature, for the fine arts as for the interpretative arts. Therefore the subject of this contribution is, strictly speaking, theatrical production in the world wide web. Dramatists use the world wide web as a space for producing theatre. They create theatrical performances in the Internet. They use different rooms/levels/environments in the world wide web to perform plays. Before theatrical productions in the world wide web can be examined more closely, some introductory comments have to be made. The paper deals with theatre in the Internet as an art form, not as a daily life-behaviour where men play their different roles. Actually, this is an important aspect too, and the studies on theatrality in our daily life consequently lead us to rethink this aspect concerning the Internet. It's not intended to start an argument about subjects like: Is the world wide web theatre by itself? Nor: Does the world wide web take the place of theatre? Nor: Is theatre and the world wide web a contradiction per se? Those reflections could maybe introduce the subject on an analogous discourse, which was established when radio and film were called into being. In this paper the world wide web is seen as a room within the meaning of stage. One of the main characteristics of theatre is the fact that theatre is happening at a certain time, in a certain place and that, traditionally, people who are participating know that it is theatre. These arguments are always mentioned to distinguish the different art forms and specially to underline the live-character and organic point of theatre. Therefore the first impression dealing with theatre in the world wide web provokes the assumption that the criterion 'in a certain place' is not effective anymore. Neither the actors nor the spectators have to go to a certain theatre, place, tent, church or whereever theatre performances take place. The world wide web could even be considered as a new extension of a place for theatre performances. As in the 60ies when dramatists started to go to public thoroughfares, to leave traditional theatre buildings, the world wide web could be seen as a next step forward to contact people. It is not necessary anymore to go out. Nevertheless if somebody wants to take part in a performance in the world wide web as an actor or a spectator he has to go to a certain place! First of all he has to be in front of a computer with Internet-access. 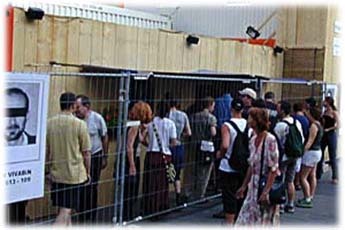 The difference to conventional theatre-places is seen in the circumstance that the participants do not have to be in the same real-room. That is to say that people from all over the world can take part in the same performance even if they are not in the same room, city, country or continent. But they have to go into the same virtual-performing-room. Each person who wants to see a certain performance has to visit the right Internet address (=URL: universal resource location). The place where the Internet actor and his spectator meet, and they have to meet, is therefore a virtual room with fictitious characters. The condition for such a virtual meeting is the real presence in front of a computer and in a certain virtual room in consideration of a certain real-time. In other words, the condition of theatre as a process of simultaneous communication is still taken for granted. Thereupon, the same time is still important. Performances which are presented in the Internet have a limited and precise time at their disposal. They are not stored up there, they cannot be retrieved at any time, apart from pieces of documentation, which could be compared with videotapes or scripts of a traditional theatrical performance. to use rooms which already exist in the world wide web. These rooms(2) are established by online meetings like IRC Channels (Internet Relay Chat) and MOOs (Multi-User Dimension Object Oriented). Theatre which is produced on a chat level is based on a text version. This is a very special form and brings on a critical point of view. The term theatre is derived from the Greek word thea. Theatre on a chat level offers only letters and sentences for viewing. The audience and the actors have to read the text and create their own, private images. No pictures are presented. For example an online text-based performance form for example is the so called chat theatre. The "Chat Theater is a dramatic storytelling form that uses [...] 'chat programs' which allow 2-100 people to have typed 'live' conversation with others using the Internet"(3). One specific type of a chat theatre is the non-graphical chat theatre. Stuart Harris, the artistic director of the Hamnet Players, has been performing scripted material on IRC chat since 1992. Also several other performance groups are using this channel for their productions. Hamnet Players is the name of a group "who perform parodies of Shakespeare and Tennessee Williams on IRC"(4). 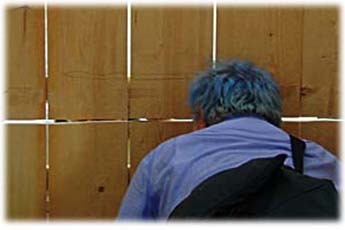 By referring to footnote number four, [http://www.ascusc.org/jcmc/vol1/issue2/contents.html] you can find a study "on their first production, a hilarious parody of Hamlet, called 'Hamnet'"(5). "Hamnet"(6) [http://www.sandiego.com/hamnet] was an Internet theatre production which was performed in December 1993. It was organized by Stuart Harris, and there were 18 actors involved. It was an experimental version of a parody of Shakespeare's "Hamlet". Stuart Harris made use of his online background with the IRC in regards to language, staging, and realisation of the text. For example he set up other protagonists like "<Drum>, <Colours>,<Action> and <Exit>"(7) to help visualize the appearance, exit, or facial expressions of the actors. He also set up a character called <audience> who gave the cyber audience the possiblity to react. But the audience in cyberspace has to be aware of the medium they are using. People generally interested in theatre but not familiar with the environment of online performances may have difficulties to express their feelings and reactions, as audience members. On the other hand, people who are proficient in dealing with cyber objects or who know the world wide web language well aren't guaranteed to behave like an audience. Just like a real audience has guidelines during a perfomance, a cyber audience also has some rules to follow. It doesn't mean that these rules have to be accepted; but they do exist. Theatre performances in the world wide web don't have to replace the traditional way of making theatre. Theatre performances in the world wide web get also applied for real material theatrical production, as a PLUS, as a medium for extension. Virtual rooms often get used as an extension for traditional stages by including video and audio. However, one of the drawbacks is that there is a separation between the audiences. There is the real audience and the cyber audience. Each has its own particular way of seeing the performance and of reacting to it depending on the group to which they belong. 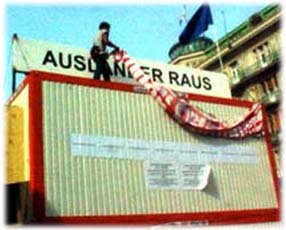 The installation of the sign: "AUSLÄNDER RAUS"
Interestingly the Internet was used to transmit the proceedings to an audience worldwide to support the performing itself, and to thematize itself as a medium. The performance in front of the opera house would have had a different dynamic without the Internet. The performers created a newspaper called "Neue Lager Zeitung" that also got published via Internet, apart from reports and comments written daily by other online newspapers. Few months later - on December 14th - Christoph Schlingensief agreed to join in a chat. Besides the theatrical aspect of chatting this chat also offered new information about the container-project. [Chat with Schlingensief] Everything that happened during and around the performance provoked spontaneous reactions from the performers. The online-transmission of the container-project was interrupted by a crash of the server. This interruption was attributed to hackers who had previously announced their intention. There actually exists an email claiming responsibility. But who really knows what's fake and what's real? And another example from Austria which represented the discrepancy between fake and real was a production by BILDERWERFER. 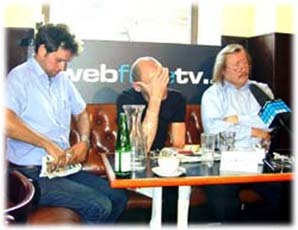 They produced "Chat in progress" [http://bilderwerfer.com] in April 2000. Directed and choreographed by Daniel Aschwanden and Yosi Wanunu, the group tried to translate the language and esthetics of chatrooms into theatrical monologues, dialogues and into movements. Spontaneous inputs from the chats going on simultaneously offered them a basis for improvisation. One performer had a webcam and transmitted the performance into a video-chatroom. It is interesting to note that this was a cooperation with the Norwegian cyber art group "motherboard" [http://www.notam.uio.no/motherboard]. In conclusion I'd like to say that I think that the future of theatrical performances in the world wide web lies more in the combination of the material and the cyber stage than in an autonomous internet stage. It is good time for experimental theatre, but by using it on its own, you are missing the real substance or, at any rate the dissonances between real and virtual bodies even if your brain is quite well trained in virtual imagination. (1) Eric Bentley, Cit. in: Lazarowicz Klaus u. Balme Chistopher (Hrsg. ), Texte zur Theorie des Theaters, 1993, 39. (2) Cf. : Monika Wunderer, Die virtuellen Bretter der Welt: Theater in Public Space, Dipl. Wien 1997, 25f. (6) Cf. Monika Wunderer, Die virtuellen Bretter der Welt: Theater in Public Space, Dipl. 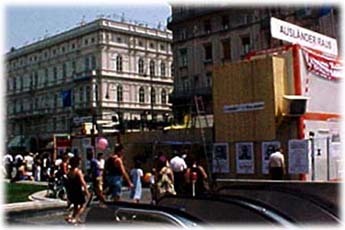 Wien 1997. (9) Source: Der Standard, 12.06.2000, http://www.derstandard.at [Retrieved: 12/06/2000]. I'd like to acknowledge gratefully the support of Peter Horn (Vienna) who has put together the screenshots for this paper.